Looking to understand Bipolar disorder? New Life counsellor Becky Brown helps readers deal with the mood changes emotional struggles and confusion of loving someone who has bipolar disorder. Brown understands that loving someone who has bipolar disorder is a challenge on a daily basis. This practical resource reminds readers they are not alone. Becky L. Brown is a licensed clinical counsellor and the director of the counselling network of New Life Ministries Counsellor Network. She previously had her own private counselling practice and facilitated small groups as part of the New Life Ministries Weekend Intensives nationally. She and her husband live in New Carlisle Ohio. Stephen Arterburn is the founder and chairman of New Life Ministries and host of the nationally syndicated Christian counselling talk show New Life Live! heard by over two million people each week on nearly two hundred radio stations nationwide. He is the bestselling author of books such as Every Man's Battle and Healing Is a Choice. With over eight million books in print Arterburn has been writing about God's transformational truth since 1984. His ministry focuses on identifying and compassionately responding to the needs of those seeking healing and restoration through God's truth. 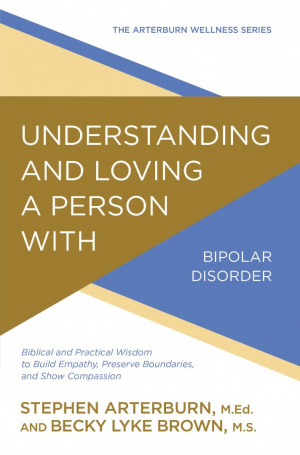 Understanding and Loving a Person with Bipolar Disorder by Stephen Arterburn, Becky Lyke Brown was published by David C Cook in September 2018 and is our 8982nd best seller. The ISBN for Understanding and Loving a Person with Bipolar Disorder is 9780781414920. Be the first to review Understanding and Loving a Person with Bipolar Disorder! Got a question? No problem! Just click here to ask us about Understanding and Loving a Person with Bipolar Disorder.